Grab your family and friends and suit up, because this is everything you love about tubing, minus the worst part – hauling your tube back uphill! 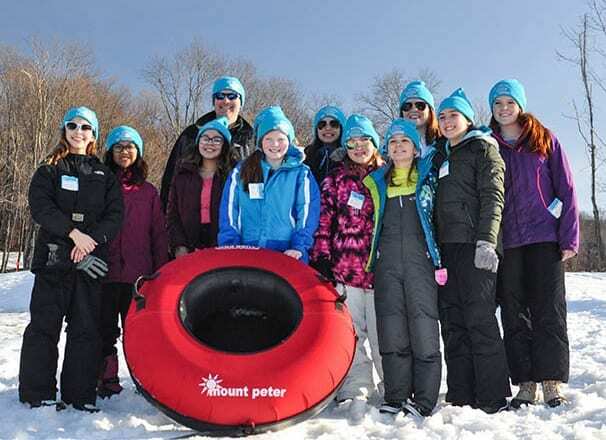 Mount Peter puts the “win” in winter, with a speedy, multi-lane 600-foot tubing run that is also equipped with a carpet lift! Tubers hurtle from top to bottom at exhilarating speeds, then just hop on the lift for a laid back ride to the top. You’ll squeeze a lot more runs into your session! Tubers must be 42” or taller to ride single. Tubers 36” to 48” may ride in a tandem with a paying adult. Booking online is highly recommended - sessions fill up fast! Kids under 42” tall don’t have to miss out on the good times. We’ve set up a winter wonderland complete with a kid-size tubing hill and a snow play area, especially for our littlest adventurers. Parent supervision is required, but we think you’ll have a good time, too! Tubing Run tickets allow access to both areas. Appropriate winter attire will ensure your tubing experience is comfy, rad and safe. Dress in warm layers that can be removed if necessary – it’s easier to cool off than warm up. We recommend treaded hiking or winter boots, waterproof snow pants, jackets and parkas, waterproof gloves, hats and scarves, and sunglasses or goggles to protect from sun and glare. Unacceptable footwear includes women’s wedge boots, rain boots, sneakers, etc. You must have a valid tubing session ticket and sign a release form to use the Tubing Run or Little Tikes Tubing Play Area at Mount Peter. 80+ Tubers: Wow, that’s awesome! Call us 7 days in advance to discuss details of supersized groups! Tubing is like riding a cake downhill! What better way to celebrate a winter birthday at any age. 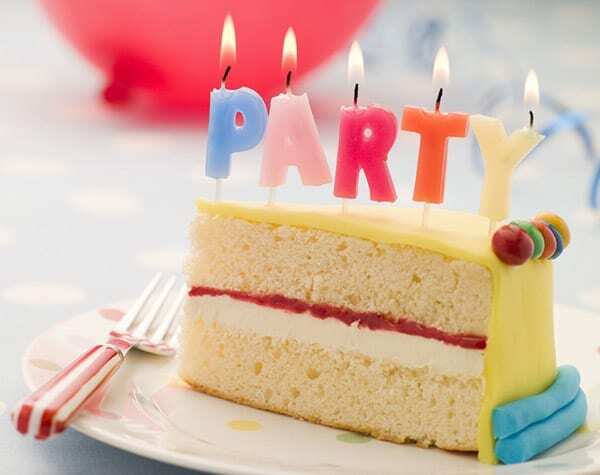 Our group rate of $27 per tuber applies to parties of 15-39 guests. All group bookings require a minimum of 48 hours notice. Call (845) 986-4940, ext. 8010, or email tubing@mtpeter.com to book your group today. Please read our Tubing Responsibility Code prior to reserving your session. Hours and pricing are subject to change at any time. Cancellation Policy: Individual reservations may be moved to a different open session date and time if requested 24 hours in advance. 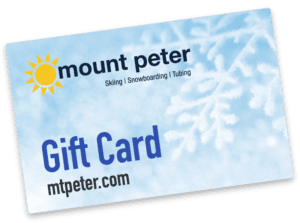 If Mount Peter must cancel a session due to the weather, reserved tickets for that session will be rescheduled for another open session of the ticket holder’s choice. Weekend Tubing Available thru 3/24. Please call or email tubing@mtpeter.com if interested in 3/30 or 3/31. Sessions are limited and reservations are encouraged. Pricing & session hours subject to change, and additional sessions may be added at any time. All available tickets are listed online. If we are sold out on-line, we are completely booked and cannot accept any additional reservations. Before you arrive at Mount Peter, please print and complete our Assumption of Risk Agreement. Bring your completed form with you. Each tuber is required to present a completed Assumption of Risk form at the Tubing Ticket Counter before being able to begin any reserved session(s). Tubers under the age of 18 must have a form signed by a parent for each session. Please arrive 30 minutes prior to your scheduled tubing session time to allow for parking, purchasing, walk-up, getting tickets, waivers and tubing prep.